The seal is a neoprene Vacuum rubber seal for a CNC. It works incredibly well. If you try to lift the workpiece the whole bench will lift off the floor. I use my CT24 but I've not used it extensively so I'm not sure about any heat issues. I'll get a splitter for the hose soon so I can still use the CT while using the top which should also help with any over heating and hopefully won't negatively effect the suction strength too badly. That is a beautiful set up Toby , thanks for the ideas and posting! Thanks! Im glad you guys appreciate it. 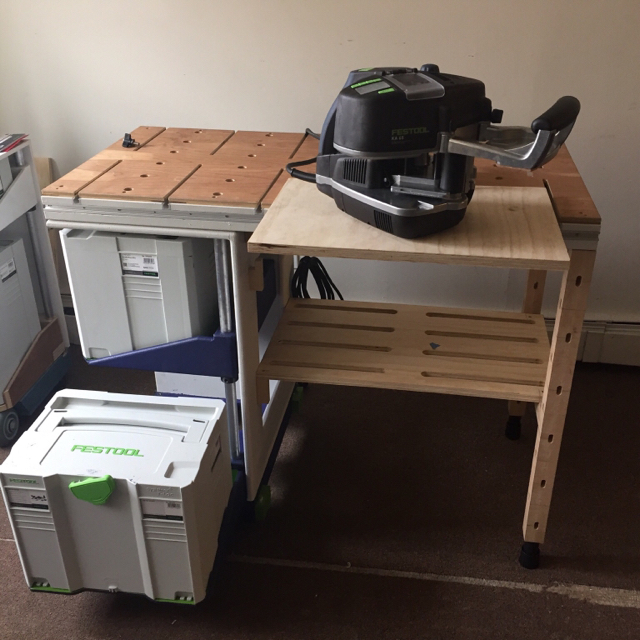 Just out of curiosity...has anyone made one with the new festool drawers? Tim, I see you have quite a selection of festool tools. I assume you have multiple Mftc carts built. How did you group your tools in each MFTC? Well now that's cool, different, and interesting. What hardware did you use or how did you build the swing-out? Very nice craftsmanship on all of them sir! Hey yeah i updated my mftc and put the festool drawers in it the touch catch ones did not stay closed. I don't post much, but for the second time I read this full post. Here's a little teaser on my progress. A little taller to accommodate a top drawer and wider for systainer room side to side. Hi all, I've been eyeing this project for awhile now and finally decided to make the festool plunge and trying to decide which dust extractor to purchase. Which dust extractors fit under the shelf? It appears to the be mini or the midi? I added a pair of brackets made from leftover baltic 1/2" ply and a piano hinge. So far, this works pretty well! Bracket retaining pin is made from paduk and tapered to a friction fit. I also added a moxon vise sized to fit the breadth of the bench. I used the sjobergs smart vise and a couple other designs for inspiration. The rear shows that it can be clamped just about anywhere. Isn't this all you need to use the mini/midi with the CMS Y hose? Absolutely. I have that and use my Midi with my CMS quite often. Some people have used non-Festool parts to achieve the same thing too. Onieda makes an anti static right angle hose connector that I use with my Midi all other Festool hoses. you can find them in the Dust Deputy accessories pages. Good finds on the adapter options - I was told it was NAINA and should have searched harder. The Oneida option looks promising. Note also that you can adjust the design of the MFTC shelf to accommodate the taller CT models. Note to all: Lessons learned. 2. The rail slots on the top are nice if you plan on traveling with the MFTC a lot. If you are building it to keep in your garage as a space-saver, just add another t-track. You will find it more useful and you can hang your guide rails on the wall. 3. When buying a perforated top (if you swing that way) check and double check the dimensions. I had to cut a spare bit from my cutoff to extend the length to fit. The top was not the same size as the final interior dimension and came up a few inches short. The T-55 and domino made the extension seamless, but I know it is there. 4. The folding extension tables are awesome for anchoring the MFTC to a post or built-in bench, if you have one. Just extend your top and clamp to a nearby top or leg and it is incredibly strong. I can clamp the MFTC to my wall to brace it for planing and I can plane away with ZERO play. No need for an overbuilt bench! Can you recommend exactly which part? I see a number of options, but not sure which. Also, does the y-adapter fit directly to the Ultimate Dust Deputy? I am thinking of getting that as my next purchase. Thanks! I have a built-in office to knock out - after that I will likely be getting the UDD! 5. Unless you are really hurting to keep the weight down, keep the extra five ounces and don't cut out the top of the base cabinet. The hole allows a ton of wood dust and chips into whatever you have in the drawers. If you are only using Systainers, you might be all right. Still, when put away, you may want to place a small tool or jig on the cabinet for transport and the cutout may make that difficult as well. I want to buy MFTС drawings. Your web site is not working.